Around the world, students of all ages are leading change within their school and communities. It's election season and no matter whether it's running for homecoming courts, giving speeches for student council/government, or advocating for a school, local, national or global cause, students have a voice that should be amplified. Transform traditional practices and maxime impact with Flipgrid! First, set up a grid for student leadership. Create topics for students to express their ideas, motivate with speeches and inspire change in other students. Set up the topic for success! Set your Launch and Freeze Dates to set when you want to launch and end student responses. Section 3: “Topic Attachment” Add a online form for voting (Google Forms, Microsoft Forms, SurveyMonkey, etc.) to automatically calculate the number of votes. 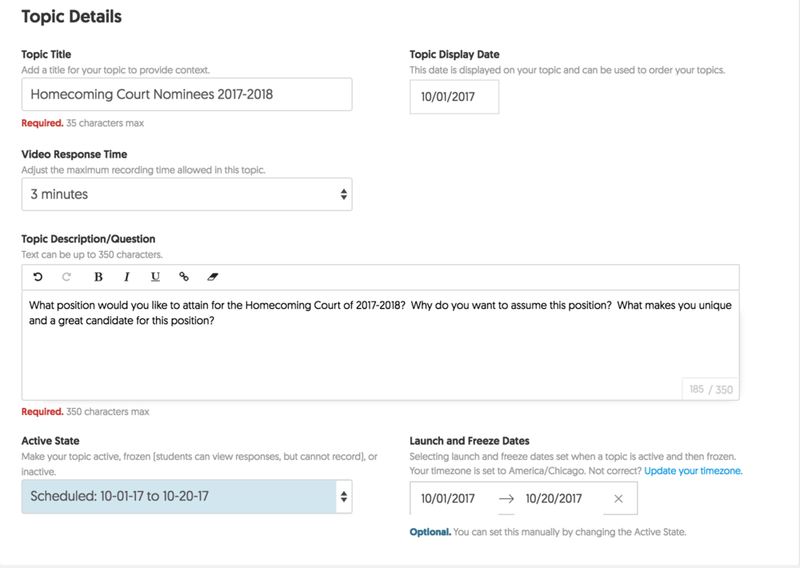 “Response Moderation” This will ensure only the students who are running for homecoming court’s videos will be displayed once you approved them. “Response Link - “Public” so those who have access to the grid will see the student resources. Allow students to add resources such as a homecoming poster advertisement or slogan. "Response Title" to add hashtags for such as "court positions" for sorting purposes. For example if "#king" is typed once you click on the hashtag all the student responses with #king will be sorted together. Share the topic for students to add their voice. The topic can be shared via link, QR Code, embedded on a school webpage or on social media. Yay! Now all of your videos are in one place to all to access with ease and a link is there ready for them to vote! On the freeze date begin adding the moderated videos so students can view their peers responses and use the form to begin voting! This tip broadens impact, maximizes time, and fosters student communication and creativity.